COLUMBUS, Ohio - (October 6, 2014) - Momentive Specialty Chemicals Inc. (“MSC”) won the “People’s Choice” Award for the “Most Innovative Composite Part” at the annual Society of Plastics Engineers Automotive Composites Conference & Exhibition (ACCE) last month in Novi, Michigan. 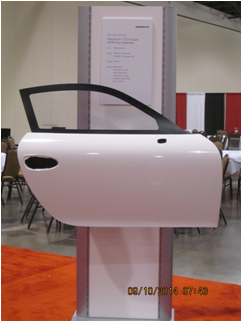 The lightweight carbon fiber epoxy door structure submitted by MSC was singled out by vote of conference attendees. Judging for the competition was based on the impact and trendsetting features of each application, including construction materials, processing methods, assembly methods, and other technologies that made the application possible. Design benefits, weight and cost reduction, parts consolidation, functional integration, and improved performance were also taken into consideration. The winning component was a light-weight, carbon fiber epoxy door and window frame profile produced by Benteler-SGL for 2013 and later Porsche 911 GT3 Cup coupes. The composite was manufactured by high pressure resin transfer molding (HP-RTM) using MSC’s EPIKOTETM 04695-1/EPIKURETM 05357 epoxy resin system, carbon fiber (Sigrafil® type C40 supplied by SGL Group) and polyester fiber. The component’s Class A surface was finished in the body color. Innovative features of this part include a simplified, integrated 2-piece design with a single structural inner piece incorporating the header, and a Class A outer panel. The door is a light-weight, trimmed body structure weighting 5.5 kg, compared to 15.0 kg for the standard series door. The raw body of the door weights 4.0 kg and the polycarbonate window and paint weight 1.5 kg. The inner and outer shells are manufactured via HP-RTM, and the outer shell is designed as a “micro-sandwich” to achieve the requisite buckling strength and performance at the minimum weight. Design benefits of this MSC epoxy resin composite part are: a greater than 60% weight reduction, compared with metal; lower vehicle center of gravity; Class A appearance; and short cycle-time production. The HP-RTM process is set up in automated steps, accommodating build rates from low volume (500 pieces/year) to high volume (up to 100,000 pieces/year) with a fully automated process line.